A view of the Grand Union canal next to the reservoirs at Marsworth, complete with narrowboat. As ever these days, the taken date/time shown is actually when the shot was saved after processing. That is lovely. Mist makes pictures so evocative. This is lovely, the mist creates a nostalgic and bygone feel. Beautiful misty scene - the two people seem to add to it. Love the type of boat. How really interesting. You broaden my world in so many ways. A beautiful misty canal capture!! Great reflection of the narrowboat!! Fav!! Love misty photos. Gives an air of mystery! Beautiful shot. Misty and atmospheric. Love the mysteriousness in this image. This is such a lovely moody shot. Fav. The boat coming out of the mist with it's sharp reflection contrasts so well to the misty scene around it, lots of atmosphere. Like the curve leading round, the people add interest and give some definition too. On close up you can just see the lock gates. I just so love river shots. FAV. This is absolutely marvellous. Looks like you've just walked into Narnia. When my son was in the UK he had a spell living just in front of one of the canals and I used to enjoy watching these narrow boats passing by. I agree with all the comments. A brilliant shot. FAV! A beautiful and serene shot. The atmosphere and the subject are perfect. Fave. What a wonderful capture. Love this. Wonderful beauty of the mist captured in this scene. I love it, Alison! Already faved, have come back to comment. This is so beautiful and a perfect example of when to go B+W. 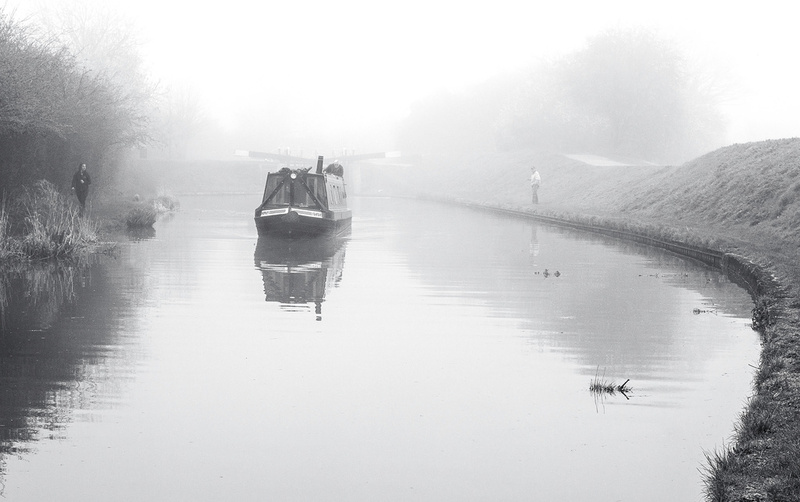 The narrow boat disappearing into the bright mist and lock gates is stunning. Lovely! The fog adds so much atmosphere. Would so love to be on one of those canal boats! A fav...really like it in b&w! That's a gorgeous shot, Alison! Deserves a fav. Wonderful atmospheric shot.....love the mist. I can feel the air, crisp, slightly chill and the mist pushing past your nose. There's something about walking along a canal path with the rising mist all around that feels very English, timeless practically. Surprising looking at your timestamp, this is late evening. I could have sworn it was early morning.